NBCUniversal is launching a new channel devoted to comedy — on the Internet instead of cable TV. The media company is hoping you'll pay $3.99 a month for it. 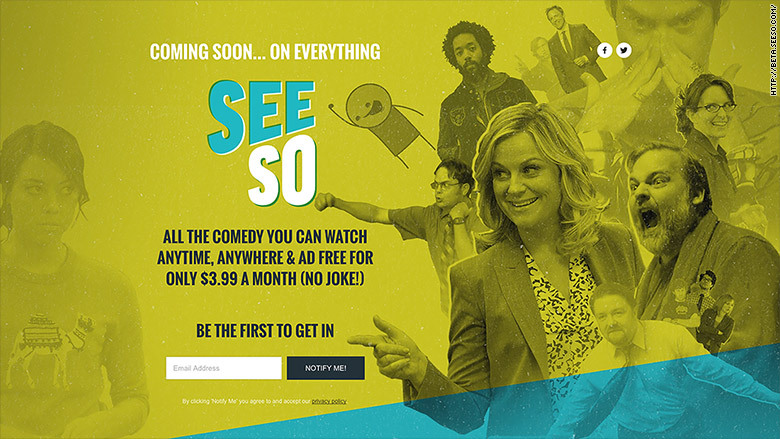 Called Seeso, the channel is launching in January with a no-credit-card-needed free trial. The ad-free service will offer a mix of standup comedy videos, exclusive shows that aren't available on other sites, and clips of NBC stars like Jimmy Fallon. Seeso is meant to fill a "big niche" for comedy nerds, NBC executive vice president of digital enterprises Evan Shapiro said at a Thursday morning press conference. He said it will "complement," not replace, existing sites like Hulu (which NBC co-owns) and Netflix and the traditional cable television bundle (which is NBC's lifeblood). Why not launch it as a cable channel? The economics are — potentially — more appealing online. Shapiro was blunt: "I think there are enough television channels. I think we have enough television channels." He said the intent is "not to just protect our ecosystem, but to grow it." Stars like Amy Poehler and Wyatt Cenac will be appearing in new shows, as will a long list of up-and-coming comics. While there will be so-called "library" shows — like old episodes of "The Office" that are already available on other streaming sites — Seeso's focus is the same as Hulu's and Netflix's: exclusivity. More than 20 "original series" are in the works for 2016, Shapiro said. "People stick around because of the original stuff, the stuff they can't get anywhere else." "The UCB Show" will feature highlights from Upright Citizens Brigade standup events. Another series will have highlights from Carolines on Broadway. Other original series include "HarmonQuest," from Dan Harmon, the creator of the beloved comedy "Community," and "Wyatt Cenac's Night Train." In one case NBC has licensed a show that was born on YouTube, "Amazing Gayl Pile," and ordered two new seasons of it. There will also be a series called "Hidden America," with the comedian Jonah Ray, described as a spoof of CNN's "Anthony Bourdain: Parts Unknown." Comedy concerts will be live-streamed one a month. Seeso has also licensed the exclusive rights to two classic shows that aren't streaming anywhere right now, "Monty Python's Flying Circus" and "The Kids in the Hall." Shapiro emphasized that he calls Seeso a "channel," not a service. To that point, a video — perhaps a recent clip from Fallon's "Tonight Show" — will start playing when people log on, before they choose something to watch.